02/19/2013: Jerod Green, 36, was sentenced in Green County, Pa. court Tuesday morning. A jury convicted Green last year on third-degree murder charges in the May’s death during a police pursuit. Green has been sentenced to 25-50 years in prison. Green, 36, will not be eligible for parole until he serves 25 years, Pennsylvania corrections and parole officials said. That will be in 2037, when Green is 60 years old. If parole is never granted, he will complete his sentence in 50 years. There is no good time — time off for good behavior — for violent offenders in Pennsylvania, officials said. According to Brandy Brubaker of the Dominion Post, Morgantown: Greene County, Pa., Judge William Nalitz said the only thing he could do to keep Jerod Green from driving drunk and killing again was to put him behind bars for a long time. “I am struck by the inevitableness of this,” Nalitz said Tuesday. “You were going to continue on this path until you killed someone or yourself.” Green, a repeat DUI offender, was driving drunk and fleeing police from Monongalia County early Feb. 18, 2012, when he crashed into May’s patrol vehicle, which was sitting on the side of Interstate 79 just over the Pennsylvania border. “You have devastated one family and you wounded Deputy May’s department and his community grievously,” Nalitz said. Jerod Green Found Guilty of Third Degree Murder — What is the difference between First and Third Degree Murder? 12/13/2012: The jury has rendered its verdict in the trial of Jerod Green. Green was found guilty of 3rd degree murder (instead of the 1st degree murder charges he was facing) for killing Sgt. Todd May on February 18, 2012. Green will be sentenced later this year. He is facing up to forty years in prison for the third degree murder charge. The jury also returned guilty verdicts to charges of homicide while DUI, homicide while violating the vehicle code, fleeing while DUI, DUI above .16, speeding, and duty in an emergency response area. Those charges could add a maximum of about 29 years in addition to the 20 to 40 years for murder if all of the sentences were run consecutively, according to Pennsylvania code. What is the difference between first and third degree murder? In most states, first-degree murder is defined as an unlawful killing that is both willful and premeditated, meaning that it was committed after planning or “lying in wait” for the victim. A general definition of third degree murder: Killing that resulted from indifference or negligence. Usually there must be a legal duty (parent – child), but can also include crimes like driving drunk and causing a fatal accident. Third day of trial: Jerod Green’s defense attorney only presented one witness on Green’s behalf. Green himself declined to testify on his own behalf. Jerod Green’s crash reconstruction expert said he believes Monongalia County Sheriff ’s Department Sgt. Todd May pulled into Green’s path as Green fled police Feb. 18 on Interstate 79, and, therefore, caused the crash that took his life. Engineer and professional crash reconstructionist Richard Bragg said the assessment of the crash scene by the prosecution’s expert was flawed and said he doesn’t believe Green intentionally hit May, as the prosecution has alleged.Bragg testified Wednesday in the third day of Green’s murder trial in Greene County, Pa. He was the sole defense witness, as Green opted not to testify on his own behalf. Both sides rested their cases and closing arguments will begin this morning. Bragg said that, as May pulled into the interstate, Green could not possibly have had enough time to react and get out of the way quickly enough to avoid a collision. Source: The Dominion Post, “Closing Arguments Today,” by Brandy Brubaker, 12/13/2012. 12/12/2012 update: Cpl. John Weaver testified Tuesday in the second day of Jerod Green’s murder trial about his investigation of the fatal crash scene and explained why Green’s defense is improbable. The trooper said he believes May tried to turn his SUV away to get out of Green’s path, but Green turned his vehicle toward him again and hit him. He said Jerod Green floored his pickup truck and drove directly toward Monongalia County Sheriff ’s Department Sgt. Todd May’s SUV just before the crash that killed the deputy. Weaver said Green entered I-79 south at Mount Morris, Pa. Previous testimony indicated that he was followed closely behind by several law enforcement officers, two of whom said they witnessed the crash. Weaver said Green should’ve kept heading straight in one of two open lanes of travel if he wanted to continue fleeing. “He sees a police car and, instead of taking the open path, he moves toward that police car,” Weaver said. Weaver said Green left the on-ramp early. If Green had followed the on-ramp to the end, he said, there wouldn’t have been a crash. Weaver said Green was traveling about 98 mph and his truck wouldn’t let him go any faster. At about 2.5 seconds before the crash, modules in his truck indicated that Green had his gas pedal pushed 40 percent of the way down. At about 2 seconds before the crash, Green had it pushed 100 percent down, Weaver said. He certainly would’ve saw May’s patrol car — a Jeep Grand Cherokee — with its lights flashing, Weaver said. Green never hit his brakes, Weaver said. May, he said, had slowly driven through the grassy median between directions of travel and, would’ve most likely seen Green coming right toward him. Weaver believes, in a last-ditch effort to get out of the way, May cut hard to the left and accelerated to 31 mph. Green then turned his truck to the right, toward where May was turning, and the left front of the truck violently impacted the right front of May’s Jeep, Weaver said. Weaver said there are two possible reasons that Green would’ve turned his truck to the right: Because he was trying to turn away from May’s Jeep, but inadvertently turned the same way May did or because he was intentionally trying to hit him. Weaver said it only makes sense that Green intentionally tried to hit May because Green should’ve hit his brakes and traveled straight if he was trying to avoid a collision. The trooper also noted that May didn’t position his vehicle in a way that would’ve made sense if he was intending to block or ram Green’s truck as Green’s defense has claimed. He said May was most likely intending to join in on the pursuit. Weaver said he conducted his investigation by gathering data recorded in modules inside both vehicles, diagramming marks and debris at the crash scene, studying the wreckage, reviewing witness statements, and entering data into a specialized computer program. Other testimony concerning text messages back and forth between Green and two women the night of the accident indicated that he was distraught and possibly suicidal. For details, see the Dominion Post. Source: The Dominion Post, Morgantown, WV: Brandy Brubaker, reporter. 12/10/2012 update: Jerod Green’s trial began today with opening arguments from both sides. In the opening statement in the trial of Jerod Green, Greene County PA District Attorney Marjorie Fox told a mostly male jury that Green committed the “deliberate act of murder” the morning Todd May died. She said Green intentionally drove his pickup truck into May’s parked patrol vehicle as Green fled police trying to pull him over for driving drunk and fleeing a crash on Easton Hill. May’s vehicle, she said, was parked in the median of I-79 south, with its lights activated. “He didn’t aim a gun at Sgt. May. He didn’t put on a dynamite vest and jump on Sgt. May, but, in the early morning hours of Feb. 18, his Silverado was a deadly weapon,” Fox said. Green’s attorney, John Bongivengo, said Green had no intent or desire to kill May. Instead, Bongivengo said May’s vehicle pulled out into the path of Green’s. He said a crash reconstruction will support his claim. The commonwealth called about 17 witnesses Monday, some whom testified briefly about items in evidence and other procedural matters. Their case will resume this morning. Sheriff’s Department Sgt. J.E. Burks told jurors Green smelled strongly of alcohol and slurred his speech when he was pulled over on the Easton Hill in Morgantown. He first lied about being at the scene of the hit-and-run, but then said the other driver caused it and he fled because of four previous DUI convictions, Burks said. Another deputy testified that Green told him he had taken some prescription medications that morning — one of which was to treat his bipolar disorder — and said he hadn’t been drinking. All of a sudden, Burks said he heard that deputy, Dave Wilfong, yelling for Green to stop and then saw Green driving off. A pursuit began, which eventually led to I-79. Burks said he was directly behind Green as he entered the interstate. Burks said he saw Green speed up, heard his engine roar, and watched as he drove across both lanes of traffic and directly into May’s patrol vehicle, which he said was parked in the median. May’s vehicle spun violently, he said. There were debris and smoke. Star City Police Department Lt. Varndell said he also saw the impact as he followed behind in the chase. He called for EMS and ran to the deputy’s vehicle, not knowing who was inside. Varndell said May was lying across the back seat. He couldn’t reach a pulse point. A fire erupted in the hood and a passing tractor trailer driver rushed over with an extinguisher. Varndell returned to May and noticed he was breathing. A nurse, traveling on I-79, stopped to help. They moved May onto the ground and EMS arrived, he said. Green’s ex-girlfriend, Holly Brotherton, said she and Green texted back and forth and spoke briefly while he was at a Ruby Tuesday restaurant the night May was killed. She said Green told her via text that she was right to leave him because he was “the devil” and a bad person who would’ve ruined her life. She said she urged him to stop talking like that and told him to call her if he needed her. The next morning, she found a text that she hadn’t received earlier because her cellphone had no service. The text was from Green and said he lost the best thing that had ever happened to him and said he didn’t deserve to “live this life with everyone else,” Brotherton said. Rachel Hutchinson testified that she saw Green at Bugsy’s, a bar on Point Marion Road, later in the night. He was slurring his speech, laying against the table and not making much sense, she said. Skylar Johnson testified that a large pickup truck struck her car as she traveled down Easton Hill in the early morning hours of Feb. 18. She said the truck drove off. Police later charged Green with the crash. Johnson said her car was destroyed, but she declined treatment from paramedics. A forensic scientist with the Pennsylvania State Police said Green’s blood alcohol content was .189. The legal limit for driving in both Pennsylvania and West Virginia is .08. Pennsylvania State Police Trooper Joseph Popielarcheck said he arrested Green at the crash scene and said he smelled of alcohol, had slurred speech and swayed as he stood up. 11/15/2012: Nine men and three women have been selected to serve on the jury for Jerod Green’s trial set to begin on December 10, 2012 at 9:00 a.m in Greene County, PA. The jurors and alternates chosen have been instructed to discuss the case with no one, to attempt no investigation of the case, and to contact the court if anyone tries to contact them about the case. 10/12/12 Update: According to Brandy Brubaker of the Dominion Post in Morgantown, Jerod Green is set to go to trial in December for the death of Monongalia County Sheriff ’s Department Sgt. Todd May. Greene County (Pa.) Judge William Nalitz scheduled Green’s trial for Dec. 10. A jury will be selected Nov. 14. Green’s attorney, John Bongivengo, said all pre-trial issues have been resolved and they will be ready to go to trial in December. Bongivengo previously asked the court to move the trial to another county because of pre-trial publicity, but Nalitz said he would decide if it is necessary after first trying to pick a jury. 9/7/12 Update: A Pennsylvania judge denied almost all of Jerod Green’s attorney’s requests for evidence suppression, but did agree to throw out Green’s alleged admission that he had been drinking the night of the crash that killed Monongalia County Sheriff ’s Sgt. Todd May. According to WAJR radio news, that testimony will not be allowed because it was allegedly stated by Green before he was read his rights. Green, 35, of Morgantown, is awaiting trial on charges of murder of a law enforcement officer, homicide by vehicle while DUI, and criminal homicide, among others, for the Feb. 18 crash that killed May. Police in Pennsylvania and West Virginia accused Green of driving drunk, fleeing a crash on Easton Hill, driving away from officers who pulled him over on W.Va. 100, and leading police on a chase across the state line thatended when he hit May’s patrol vehicle, which was parked in the median of Interstate 79, just over the Pennsylvania line. Green, however, alleges that May’s vehicle struck his. Jury selection in the case is slated to begin Nov. 14, although court officials said a trial date has not yet been set. In Greene County, a jury is selected sometimes weeks or months before the actual trial begins. Greene County Judge William Nalitz ruled this week that the commonwealth may introduce at trial the results of Green’s blood alcohol content (BAC) testing and all evidence obtained from searches of Green’s truck, unless the court later determines that specific evidence seized in the searches is inflammatory. Police previously alleged that Green was driving with a BAC of .189 — more than twice the legal driving limit of .08 — the night of the crash. They have not made public any potential evidence seized with the search warrants. Nalitz also ruled that the commonwealth may not introduce Green’s alleged admission to Pennsylvania State Police Trooper Joseph Popielarcheck that he had been drinking the night of the crash. Popielarcheck briefly spoke with Green while hewas handcuffed in the back of a sheriff ’s deputy’s vehicle just after the crash and asked him if he had been drinking. Shortly thereafter, the trooper placed him under arrest and read him his Miranda rights, the trooper previously testified. Green’s attorney, John Bongivengo, argued that Green was already in custody when he was in the back of the cruiser, and as such, his alleged statement should be suppressed because he hadn’t yet been read his Miranda rights. Nalitz agreed with that argument, although he didn’t accept Bongivengo’s insistence that all of the evidence obtained after the cruiser questioning should also be stricken. Nalitz said in his order that Popielarcheck still had reason to believe Green was intoxicated without Green’s own alleged admission because he said Green smelled of alcohol and was unsteady in his gait. Bongivengo also argued that the evidence obtained from search warrants should be barred from trial because the search warrants were “overly broad.” They included the seizure of items such as Green’s cell phones and his GPS and his truck’s event data recorder. Nalitz, however, said the warrants asked for the appropriate things an officer would need in a fatal crash investigation. Nalitz said, at this point, it is impossible to tell if the evidence will be fruitful to either side. He said he’ll make additional rulings if the commonwealth tries to introduce any evidence he deems irrelevant or inflammatory. 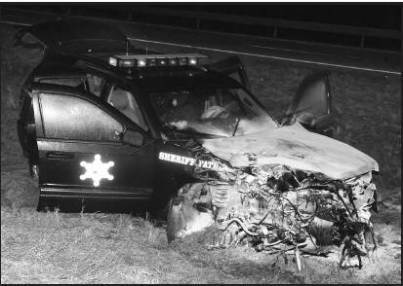 Original story: Early Saturday, February 18, 2012, a tragic car accident caused the untimely death of Monongalia County Sheriff Deputy Sgt. Michael Todd May. According to WV Metro News and The Dominion Post of Morgantown, WV, Sgt. May was assisting in the pursuit of a hit and run suspect fleeing police when his police cruiser was struck on I-79 just north of the Pennsylvania border. Jerod Alan Green of Morgantown, formerly from Oklahoma, has been charged with homicide by vehicle while DUI, first-degree murder of a law enforcement officer, second degree manslaughter of a law enforcement officer, DUI of a combination of alcohol and drugs, and several other charges. On line records from the Oklahoma State Courts Network indicate a man with the same name and birth date as Green pleaded guilty to third-offense DUI and subsequent offense DUI almost five years ago. Update February 20, 2012: The Dominion Post of Morgantown documents that Green had previously been charged with at least five DUI charges, as well as assault and battery and methamphetamine charges which were later dropped. Someone dies in an alcohol-related traffic crash every 30 minutes. Every two minutes someone is hurt (non-fatally injured) in an alcohol-related accident. Drunk and drugged drivers continue to drive our roads and highways, causing more than 17,000 Americans to die each year. According to the Centers for Disease Control and Prevention, impaired driving will affect one in three Americans during their lifetimes. According to the National Highway Traffic Safety Administration (NHTSA), between 2002 and 2005, West Virginia used a high-visibility enforcement program and cut alcohol related deaths by 18% and the numbers of drivers who tested over the .08 BAC dropped 30%. This program included increased monitoring and enforcement in conjunction with paid advertisements on radio, TV, and billboards to increase public awareness of the dangers of DUI. Many states have dropped high-visibility enforcement programs because of a lack of funding, but NHTSA continues to encourage states to maintain high-visibility programs to decrease the number of DUI related crashes, injuries, and deaths. West Virginia University presently uses an on-line alcohol awareness program for all in-coming freshmen and transfer students. The students must complete the program by certain dates or must pay a fifty-dollar penalty for missed deadlines. Morgantown public high schools also have DUI awareness programs before prom activities in the spring to increase student awareness of the hazards and legal ramifications of driving under the influence of drugs and alcohol.